Working with animals is an extremely rewarding and exciting career for those who genuinely love them. Animal training refers to teaching animals certain responses to specific conditions. It is a challenging and tough field that prepares an individual to teach and exercise animals for purposes such as companionship, detection, protection and entertainment. Animal trainers are trained instructors who carry out variety of training techniques to teach different types of animals. They prepare animals to get accustomed to human contact, and teaches them to respond to particular commands and situations. They train animals for specific tasks such as security, obedience, entertainment, racing and to assist disabled people. Animal training is a broad field which can include working with different types of animals like dogs, horses, elephants, marine mammals, birds, cats, tigers, bears, lions etc. The type of training an animal receives will vary depending on the training method used and the purpose for training the animal. So if you consider to choose animal training as your career, first you must decide what type of animals you want to work with. - Pet Trainers usually work with dogs, cats, birds etc. - A service animal trainer is essentially a specialized dog trainer. They teach basic manners and special commands appropriate to the dog's field of work. Animals are also trained specifically for detective jobs in the police department, or jobs that include guiding people with vision or hearing impaired, as well as wheel chair bound individuals or people with seizure disorders. - Train horses for a variety of competitive equine sports, including dressage and show jumping, horse race etc. The major task of an animal trainer is to train animals according to their prescribed standards for show or competition. Training an animal involves familiarizing it with human contact, introducing voice commands or hand signals and encouraging a desired response. For this animal trainers normally use positive reinforcement in a variety of ways, which includes offering toys, food, rubdowns, play etc. Some trainers consider natural behaviors of the animal and intend to modify behaviors of animals by following the principle of reward and punishment. Animal trainers have the responsibility to maintain animals health and supervising dietary habits. They provide food and water, groom, bathe, disinfect, clean and repair their cages and exercise animals. They also play with the animals, provide companionship and monitor animals for signs of injury or illness and assist in restraining them for medical treatment or transport. The work of an animal trainer may be unpleasant, physically and emotionally demanding, and sometimes dangerous. When working with animals, there is always the risk of bites, scratches and other injuries. There is very limited number of openings in the area of animal training unless you develop your own business. Technically, dog training can be a very lucrative career especially if you are really good at what you do. No formal educational qualification is necessary to work as an animal trainer ; but candidates are expected to be 12th pass or at least to have a high school certification. The education requirements may vary according to the nature of the job, since there are various jobs related to animal training. Those who wish to become Marine Mammal Trainers or Exotic Animal Trainers, require a bachelors degree in zoology, biology, marine biology, animal science or psychology. After graduation, along with an animal training certificate, a candidate can apply for the concerned job. What ever may be the qualification, to become a proficient animal trainer, one need to undergo animal training programs offered by experienced trainers or institutes. Several clubs and organisations offer training programs and voluntary certification for aspiring animal trainers that includes lectures, reading assignments and practical hands-on experience working with variety of animals. These programs will help animal trainers to establish their credentials and enhance their skills. The training programs and workshops varies with the animal trained. 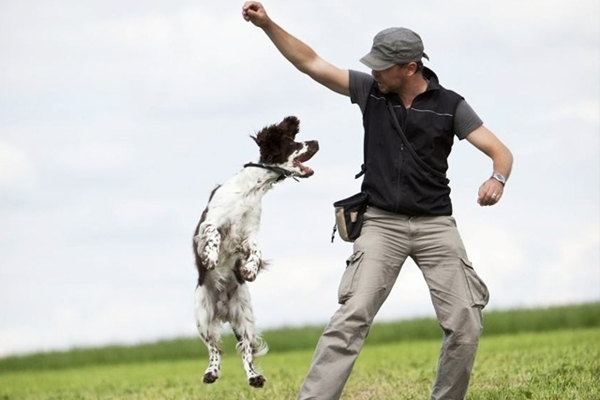 Dog trainers course covers topics such as basic study of canines, learning theory of animals, obedience principles, problem solving methods, and safety. It include a history of dog training, a course on different theories and approaches to animal learning and behavior, how to design classes and how to manage your business. Horse training coursework includes horse health and first aid, horse handling, obedience training, grooming and horse assessment. The most and the fundamental skill needed for an animal trainer is the love for working with animals, a passion for their care and patience. They should possess strong animal handling skills and must adore and respect animals and treat them with kindness. As animals cannot speak, the animal trainers should have good instructing skills and should be able to understand the activities and moods of animals. Animal trainers have to interact with many professionals and different people, so excellent communication and interpersonal skills are essential. Critical thinking, decision making skill and time management are also needed for this profession. Those engaged with the training of marine animals should be familiar with swimming and diving techniques. Besides all these, physical and mental stamina is very essential for an animal trainer because throughout their job, they have to handle physically demanding work such as kneeling, crawling, bending, restraining animals or lifting heavy supplies such as bags of food, etc. To be a prospective trainer, one must learn about the profession and must read as much as you can about animal behavior science, particularly the science of animal learning. They also need to attended seminars, workshops, conventions and perhaps mentor with other trainers. Animal trainers can find job openings at places like kennels, police force, animal shelters, zoos, stables, aquariums, zoological parks, marine parks, horse farms, horse riding clubs or private homes. They can also work in veterinary hospitals or clinics, laboratories, pet stores and research facilities. Most animal trainers are self-employed and have their own businesses and gain private clients. Some animal trainers work primarily in feature films, while others specialize in working with animals for commercials or print ads. Remuneration of an animal trainer varies according to the location and the type of animal that is being trained. An animal trainer can start up his career with an average salary of about Rs.10,000 or more per month. In this field experience determines the earning potential. An experienced person can earn a lump sum amount and they are paid on an hourly basis that varies from Rs.100/- to Rs.200/- or more. A horse trainer is paid a much different scale than a dog trainer. Horse trainers can attain excellent compensation at the high levels of their profession. Dog trainers are usually self-employed so they can set their own salary goals. The income of the self-employed dog trainers depend on the success of their business. Self-employed trainers tend to earn more than those employed by other trainers or pet businesses. Animal trainers who are working in the film and entertainment industry, government organizations and research facilities can earn better salary as compared to the animal trainers employed in any other industry. Trainers who care for exotic animals have a higher pay rate, but the jobs are comparatively rare.